While we all patiently wait for subtitles, let’s take a gander as Rinchan and I share our thoughts regarding the sweetest reunion in a K-drama this year plus the heartache that keeps on worsening each episode. JOIN US in our mini conversation! And share your thoughts too. Leila: The two weeks hiatus felt long! But because of the break, we get to savour the reunion of Seol and Jung. That was such an intense moment. Rinchan: Agreed, the week seemed to ride a turtles back, however the context in which they reunited was quite impactful. Leila: We see the importance of a break-up here. Reunion is sweeter! Anyhow, timing can be ironic. On the flip side, In Ho was looking fervently for Seol but Jung only has to wait in one place and Seol came. Aww. I was hurt not because In Ho saw Seol with Jung nor because he arrived late. In Ho was searching at the wrong direction, how can he possibly find her? What a waste. It was more heartbreaking because In Ho felt he wasn’t needed anymore..
Rinchan: This is what I love about this drama though, it’s so rich in emotion. When Seol was out alone, she was looking for a support system, but she soon comes to realize that all the comfort she needed was always right there in front of her, all she had to do was run and take her place in Yoo Jung’s arms. This moment made my heart soar, but the look of dismay on In Ho’s face, broke its wings. That moment shattered what In Ho had going with Seol during her fight with Jung, there was an illusion of exclusivity as she brought him deeper into her world, and they grew close. He wanted to be the one she could turn to like she had been doing, but moment must have made him feel like a replacement. Leila: *tear* Your words felt like In Ho inhabited you! That is exactly the emotion going on his face. The moment he turned his back around.. the pain is indescribable. Rinchan: In Ho looked so alone, on the outside looking in. Leila: I saw and felt the sincerity of Yoo Jung more this week. The way he looked at Seol.. *melts* it’s like he is stripping himself off in front of her. You know what I mean? He isn’t pretending, he is honest with Seol. His eyes don’t lie. Rinchan: I think one of Yoo Jung’s greatest hurdles is being vulnerable to someone, he wants Seol to stay, and is caught up on how not to let her go. The result of this was his closed off behavior which contributed to the strain in their relationship, but I think Seol’s push for honesty is really what propelled him forward toward progress. Leila: Now the problem I see is with Seol. She still has those bubble thoughts always on her head! Gurl, burst that bubble! She doesn’t communicate with Jung more often than I would like her to. This is one of the flaws in their relationship. Their conversations has always been my favourite. They need to TALK MORE with each other. Keeping a secret is not an option. Rinchan: This is a common problem in any relationship, where one must confront their own insecurities, but I feel that Seol has been pretty good about confronting Yoo Jung about things like his role in Young Gon and In Ha’s shenanigans, but on the other hand, hiding her problems from Jung is not conducive to a healthy relationship. They need to do more then talk, they must communicate their thoughts and feelings with an openness and honesty that will fortify their bond. Leila: When she called In Ho “Oppa”.. I just died right then and there. It was too adorable!! And In Ho is super elated, he’s on cloud 9! He can’t hide the feeling, he’s too obvious that he wants to be called Oppa by Seol. Rinchan: In Ho was definitely blushing at that moment, it was such a feel good moment, I was basking in their chemistry. Rinchan: This scenes just reaffirms how easy going and close these two have gotten with each other, and I bet In Ho relishes that. Leila: Let’s give some space for Young Gon. He’s creepy from the get go but I never thought his storyline would have significance not until I saw Episode 11. Cyber bullying is no joke. The effect is mentally draining and challenging. Rinchan: Yea, and Young Gon excels at it because he is a coward that likes to put others down, but not take responsibility for his actions. Seol: I asked you to be honest with me. And when you weren’t, it made me angry and frustrated. I thought it was all your fault. But I realised something this time. I didn’t tell you my inner feelings. And I demanded you to be honest about your feelings. I won’t do that anymore. So I want you to do that too. Don’t hide things anymore. I want to see you the way you are. Leila: OMO! It’s like Seol heard my thoughts. She decided to burst her bubble thoughts come Episode 12. Iloveit! This is the kind of relationship I want from them – bold and honest. But stupid Jung, he still does not understand it. Rinchan: Yes finally! Seol had to hit this wall in order for her to realize, it was there. It’s easy to see things from your own perspective, but sometimes it is necessary to get out of your own way and see the situation for what it is. She has been demanding that he does things her way without really meeting him half way, she must be willing to give as much as she is demanding. Also, it is necessary that both these two actually open up to each other in order for the foundation that they are building their love on is not composed of ideals and insecurities. They need to know each other and not fall back on speculatory views. Leila: So true! This is where I really adore Seol. Just a backtrack, when he asked Jung “is this what you call a relationship?” something to that effect, I just knew Seol is truly an amazing character. She never succumbs to what Jung tells her not unless she understands why she needs to follow which I find a good thing. She’s not simply his follower, nor someone who just say yes to whatever Jung wants her to do. Seol is her own person. I love that as an individual, both Jung and Seol is strengthening their love together this way. Rinchan: That’s one of the qualities that attracted Jung to Seol on top of her sincerity, Seol never tried to garner his affection for personal gain. She challenges his thinking like a partner should. Leila: In Ha’s character is also a revelation. We see how she is on the surface. But in Episode 12 I learned that, that’s how she survives. I mean, her lifestyle is so extravagant, she needs a source to maintain it. I know how bad her method is, but for her that’s her life. It’s the way she lives, period. She will do everything to have clothes and house to live in. Basic needs but with a higher price tag. She’s too materialistic to have a heart and care about real unpriced possessions. Even her pride takes a back seat because she doesn’t have money to feed her addiction. She doesn’t know the value of working hard to earn what she wants and needs because she can easily get it anyway, with her evil shenanigans expertise. What a persona! 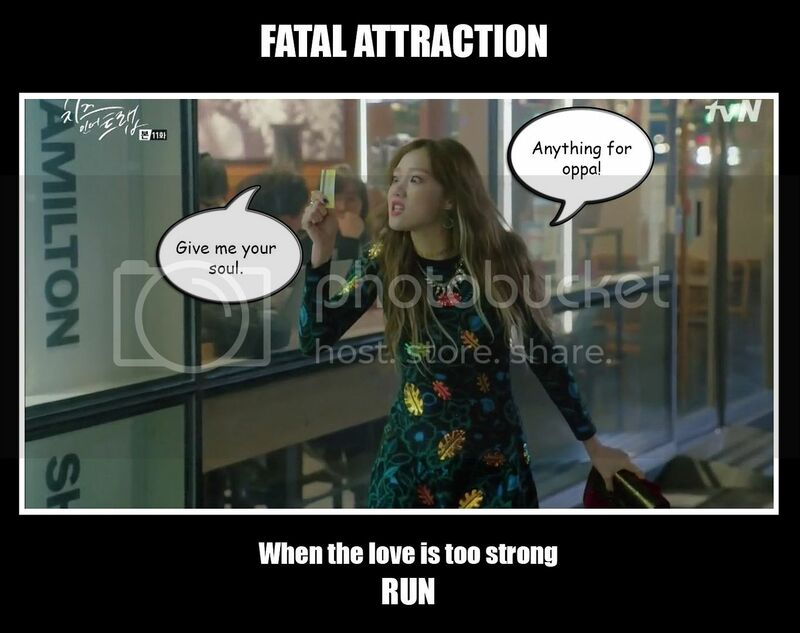 This gurl needs reality check just like Yoo Jung. That aside, she see things as is. I like that about her. She knows Yoo Jung and Baek In Ho’s foibles and take it as face value. She knows their bad side, but unfortunately that’s all she see. LOL. She takes advantage of this as well. In Ha surely knows how to put things in proper perspective. OMO. I take that back! In Ha is just being herself. And in the sea of bad people, she’s not the worse. Rinchan: I have mixed feelings about In Ha because of the way the writers initially presented her, in truth she is without scruples, but I am not sure if it is totally because she is materialistic. Her means of survival is leeching off of people, but I think it may have to do with the life lessons that she received at an early age. Under the care of an abusive aunt, there was a need for security, which was found by begging Yoo Jung’s father to take them in. Based on her conversation with In Ho, when he left her, she stated she knew he was the type that would leave her, which may hint at abandonment issues. On the other hand it may also explain her lack of attachments or deep emotional relationships. Growing up the way she did, it is very likely she came to realize that love doesn’t pay the rent, nor does pride buy you expensive things. Also these intangible feelings seem fleeting with respect to the fact that those who have loved her or claim to do so have left her or left her in some way. She doesn’t even aspire to any dream because of In Ho’s negative critique of her work, she lacks that sense of self that drives people to greater things, she is more resigned to mediocrity and believes she can’t do better and neither does she want to. Her drive to accumulate material things most likely promotes her sense of security by meeting her basic human needs, as well as giving her the assurance that these tangible things will not leave her of their own volition. Also it give her a sense of accomplishment because these are the objects that we normally attribute with the rich and successful. Mooching is like a skill set or a job, and she is successful at it. Scheming is how she learned to survive. Leila: Well said. Jung knows this fact very well that is why he is using her shopaholic addiction to his advantage. The problem is when will In Ha ever learn? Rinchan: If that ever happens, I’ll be watching with popcorn LOL. Leila: Yoo Jung’s past.. what a life. Our past has a big impact in our present. I really dislike how Yoo Jung manuevers event and use other people to do the bad deed. Damn. He grew up doing this. How can he stop himself when this is already a part of his system? Can Seol change him? Yoo Jung finds it so difficult to be honest. Dishonesty leads to misunderstanding, then anger, then hatred. It keeps on escalating until it overflows, you want to get rid of that person out of your life. It is dangerous if you allow it to consume you. Rinchan: I’m still figuring out how he can use people so effectively like chess pieces, admittedly some instances are clear like in Young Gon’s case, however I am wondering if there is some misunderstanding, it may be wishful thinking on my part. Leila: I love the manly brawl! Don’t get me wrong, I dislike fights among guys, especially over a girl. But this time its different, both In Ho and Yoo Jung deserves those punches. I want them to bleed badly. Rinchan: This definitely goes deeper than Seol, the bad blood needs to be let out so they can move on. Unfortunately I doubt it solves much but I hope they will meet each other with cooler heads next time and work things out. Leila: Yoo Jung thinks that In Ho is stealing what should have been his. When I found out the deeper meaning of what this means, I have to admit I felt hurt for Jung. But as we see more scenarios, I think this is the biggest misunderstanding, because In Ho isn’t doing anything to steal from Jung, I mean at least not on purpose. But we know how some people interpret things differently. And since Jung is the type who doesn’t speak his mind, he keeps it all to himself and his mind turn into wicked ways. Sad. Rinchan: I wouldn’t blame him for seeing things that way, look at the way his father dotes on In Ho and In Ha, but doesn’t do the same with Jung. The father definitely has different expectations for Jung, but scenes like this make it look like he was left out in the cold. Leila: Aww. 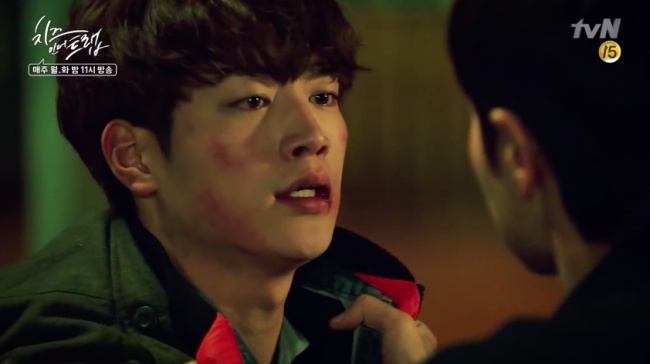 When Jung went to see Seol after the fight.. my heart softened in that moment for him. So it was In Ho who has the power to shake him! Leila: Wounds are meant to be healed. Though there will be a scar, it will heal. Rinchan: True, but this wound must be treated first, it’s totally festering. Leila: OMO. Another back story. This is getting deeper. Though Jung was very sincere with In Ho, at first. In Ho knows him too well, I think Jung got angry when he heard that In Ho pities him. Now, that makes sense. No matter how true it sounds, Jung didn’t like it especially since it came from a very close friend. Jung doesn’t speak his mind and he allowed this misunderstanding to grow even more because of that. Rinchan: You can hear Jung’s heartbreak in this scene, as he perceives an unexpected falseness in In Ho. He thought that In Ho’s affection for him was sincere, but what he heard was not In Ho’s callous way of speaking, but a portrait of himself that Jung did not like. It reminds me of the scene where the drunken Jung confesses to Seol that people saw him as a push over, it was a moment where he let her see passed his walls and reveals a glimpse of his pain. Jung has continuously been searching for a place of belonging, where he is loved and accepted for his true self, and he finds this with In Ho however he misunderstands that In Ho is actually a companion that was set in place to monitor him. He must have felt that In Ho never truly held any regard, and the bromance was betrayed. Leila: Aww. Seol. She is really special. The story is about acceptance that start with yourself. I like that. And love has a way of accepting our bad traits freely. What a genuine love Seol has for Jung. Lucky man. Their relationship is better now. I love that the situation led them to learn from it and allowed them to be more honest. Finally, a relationship that shows how to make it work. Rinchan: It definitely feels like Seol is leading by example through accepting Jung, because Jung is having a hard time accepting himself. He is constantly fighting off being thought of as strange or worrying about the perception of others. Seol’s ability to love him and his flaws show he can love himself as well. Leila: OUCH! In Ho, why are you there, sweetheart??! This show is mending my heart then breaking it again. Rinchan: Seol must house the best medicine, but in truth she is also In Ho’s support system, she knows how to comfort him. The narrative continuously reiterates how these two men are fighting for the same position or gives a feeling that In Ho is always reaching for what Jung has already attained in terms of relationships. Although In Ho has no intention of taking anything away from Jung, I feel as though these two men are meant to be apart of each others life because there fates are so intertwined. 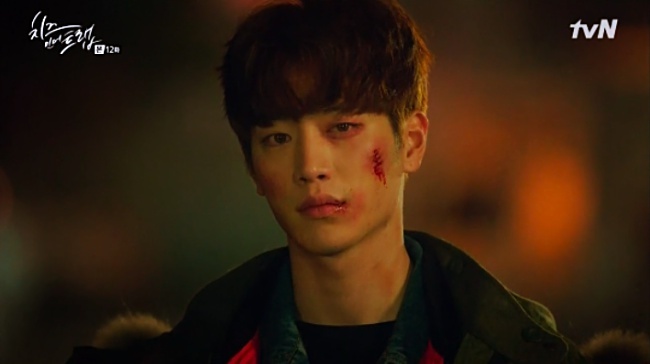 Leila: Truly knowing Jung is with Seol hurts more than his bruises. And he can feel the cold atmosphere more because he is alone. Damnit. Why does it have to be this cruel? Rinchan: I think it feeds an emptiness as the past repeats itself, Jung’s father is not In Ho’s father, and Seol is not his girlfriend. What can he call his totally his own? Leila: Good point. It’s like Jung have everything, and In Ho has none. A contrast that keeps breaking my heart. Then again, In Ho has an easy affinity for others and he’d just be fine. Unlike Jung who is careful in choosing the people in his life. Rinchan: In Ho and Yoo Jung’s story line show us an interesting set up where we witness how envy goes both ways even if one is perceived to have more than the other. The grass always seem greener on the other side even if your neighbor begs to differ, ultimately it’s a reflection of how most of us can’t appreciate or see the good we have in our life. Leila: Well said. And hopefully all of us, viewers, are learning this lesson. Contentment.